Jessica's Review: Well this become a movie or tv show I wouldn't be surprised! It was very good. Fans of Harry Potter and Percy Jackson will love this book! My 8 year old daughter had me put it on her iphone so she could read it. (hope thats ok lol) It is deff. one that elementary and middle schoolers will love. Brooke's Review: I received a copy of this book from the author to read and give an honest review. This has in no way influenced what I write or my thoughts about this book. I don't read much middle grade fiction, but this book sounded so great, I could not pass up the opportunity to see what it was about. And I'm so glad that I got the chance to read it because it really was great! I love the cover. When you read the book you will understand it better, but it's exactly how I pictured the armor worm by the main character. And the coloring of the cover is particularly eye catching. It really reminds me of something so much more mid-evil than what the book is truly about. I love the look as it shouts pure fantasy in my mind. Jack is an awesome main character. He's strong, without even knowing it. He is kind of this dweeby nerd who thinks of himself as something more in the middle. He is completely relatable as a 14 year old boy for sure. I have to say that I couldn't picture him in my mind, because I didn't find that kind of detailed description when I read the book. But it didn't deter me from continuing on and getting to know the awesomeness that was this book. My favorite part about Jack is how straight forward he is with the audience. And he does it in a chuckily way, which just made me want to keep on reading to find out what happened. He challenged the reader not to read the book, well, this is certainly what propelled me forward. Jack is a well developed character. I love Jack's friends, Will and T-Rex. They are kind of opposites, but compliment Jack's personality. You see the cockiness of Will versus the self debasing character that is T-Rex, and Jack seems to fall somewhere in the middle. And Eva is definitely an awesome interest. I love that she has a disability, but she is able to completely compensate for it. And I love that it doesn't get mentioned as something throughout the book that Jack notices. He just accepts that it is part of who she is. The entire time I was reading this book I couldn't help but think about my 9 year old son and how much he would probably enjoy it. If you enjoy books like Percy Jackson and The Olympians, then you should pick this book up for sure! I will enjoy reading the rest of the books in this series as they are released. Orphan Jack Templar has no memory of his parents and only the smallest details from his Aunt Sophie about how they died. The day before Jack's fourteenth birthday, things start to change for him. At first it's great: A sudden new strength helps him defend his nose-picking friend "T-Rex" from the school bully, and even his crush, Cindy Adams, takes notice. But then a mysterious girl named Eva arrives and tells him two facts that will change his life forever. First, that he's the descendent of a long line of monster hunters and he's destined to be in the family business. 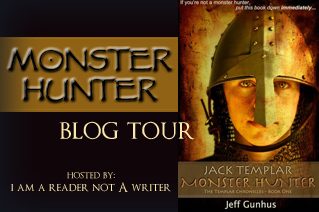 Second, that there's a truce between man and monster that children are off-limits...until their fourteenth birthday!Jack has only one day before hundreds of monsters will descend on his little town of Sunnyvale and try to kill him.